Zimbabwe Defence Forces Commander General Constantino Guveya Nyikadzino Chiwenga yesterday urged Zimbabweans to observe law and order saying any acts of vengeful retribution following the resignation of Cde Mugabe would be dealt with severely. Cde Mugabe yesterday tendered his resignation letter to the Speaker of Parliament Advocate Jacob Mudenda in accordance with the Constitution. 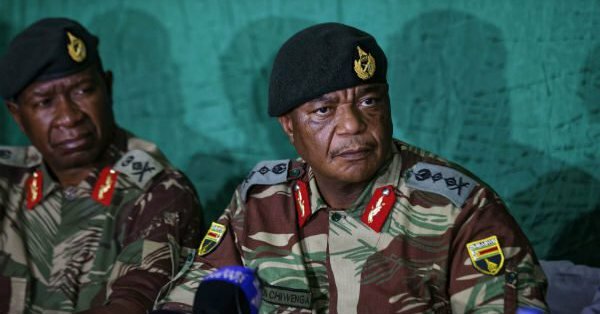 Addressing journalists at the Josiah Magama Tongogara Barracks (formerly KG VI) last night, General Chiwenga said people should exercise maximum restraint. “Against the backdrop of the latest developments in our country, your defence and security services would want to appeal to all Zimbabweans across the political divide to exercise maximum restraint and observe law and order to the fullest,” he said. “Our vaunted character and tradition as a peaceful and law abiding nation must now show in practical terms through unconditional observance of the law,” he said. “The country’s security forces and law enforcement agencies will be out in full force to ensure that law and order is observed, life, limb and property are secured. Acts of vengeful retribution or trying to settle scores will be dealt with severely. Religious organisations across denominations are encouraged to pray for peace and stability in our country. “In the same vein, students are encouraged to be well-behaved and concentrate on their studies. We further appeal to everyone to avoid abuse of the social media or any other platforms to inflame feelings or incite public disorder in the country. Gen Chiwenga’s update to the nation was part of the operation code-named “Operation Restore Legacy” which saw the military intervening to end national destabilisation orchestrated by a coterie of criminals that had surrounded President Mugabe. The operation saw a marathon of meetings between President Mugabe and the military generals. Negotiations between President Mugabe and the command element were brokered by respected Roman Catholic priest Father Fidelis Mukonori. The other members of the mediation team were the Acting Director-General of the Central Intelligence Organisation, Cde Aaron Nhepera, and the Presidential Press Secretary Cde George Charamba, who is also the Secretary for Media, Information and Broadcasting Services. In a televised State of the Nation Address at State House on Sunday, Cde Mugabe conceded that there was a crisis in the country and concerns raised by the ZDF and citizens relating to the state of the economy were genuine. He said Zimbabwe would chart a new path aimed at restoring normalcy. He also conceded that Zanu-PF was facing challenges that required attention and these would be dealt with at the forthcoming Extraordinary Congress scheduled for the week December 12-17, 2017. It is understood that several senior Government officials whom the military fingered as criminals, were taken into custody while several others are on the run.